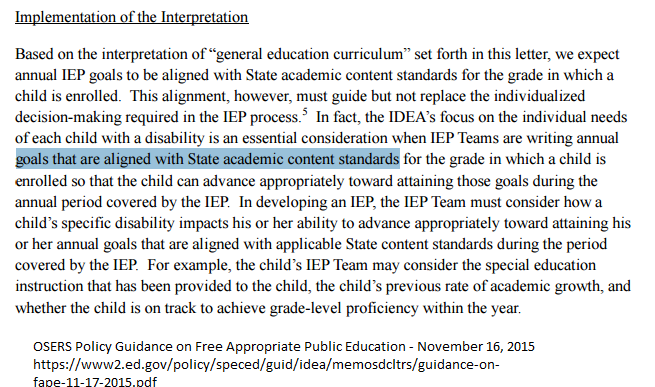 This is right on target for the team taught general education High School math classes I co-teach and where the goal is to make the grade level curriculum accessible to the mild to moderate need student with an IEP. I also teach a self contained High School math classes for students with moderate to severe needs who typically have cognitive issues. I approach the problem by trying to unpack the standards to get to a level that they might successfully access. Perhaps for your standard of identifing slope I might have a goal of identifying which line has a ‘steeper’ slope based on it’s graphic representation. Having said that I struggle to right goals for the self contained class and wonder what ideas you might have to add? As for the students in a self-contained classroom, I always look at the bigger picture. What math will the students need in post-secondary life? Slope in “real life” plays out as a rate of change, e.g. pizza toppings cost $2 each. My position is that students who will not continue with education after exiting special ed should receive math pertinent to their lives. See the category of Consumer Math in the menu on this blog. Regardless, I am happy to share ideas. Do you want suggestions for an algebra 1 type of class? I can whittle down the topics to fit a self-contained setting. Love the bike magnetics for the whiteboard to illustrate slope, I gotta get me some! More examples? No, I am comfortable with the team taught classes. As I understand the law, students with cognitive disablilities, such as the ones in my self contained classes, are never-the-less expected to have goals derived from grade level (as indicated by age) goals. I can unpack such things down to the right level, like you suggest with pizza toppings, One can then follow the letter of the law by the ‘unpacking’ of the standard down to where slope is the rate of change for adding $2 toppings. Now for math practices we also want them to model, so a model could be seen done as a graph that shows the slope of $2 toppings and $3 toppings and noting which one builds faster. I guess my issue is why these standards have to applied in such cases, and I guess my answer is that ‘it’s the law’. I think actually I’m just venting. Ah yes, I remember your consumer math effort. I agree, this is a much more appropiate standard to work towards for students that are moderate to severly affected. Please continue with your good work, and many thanks!